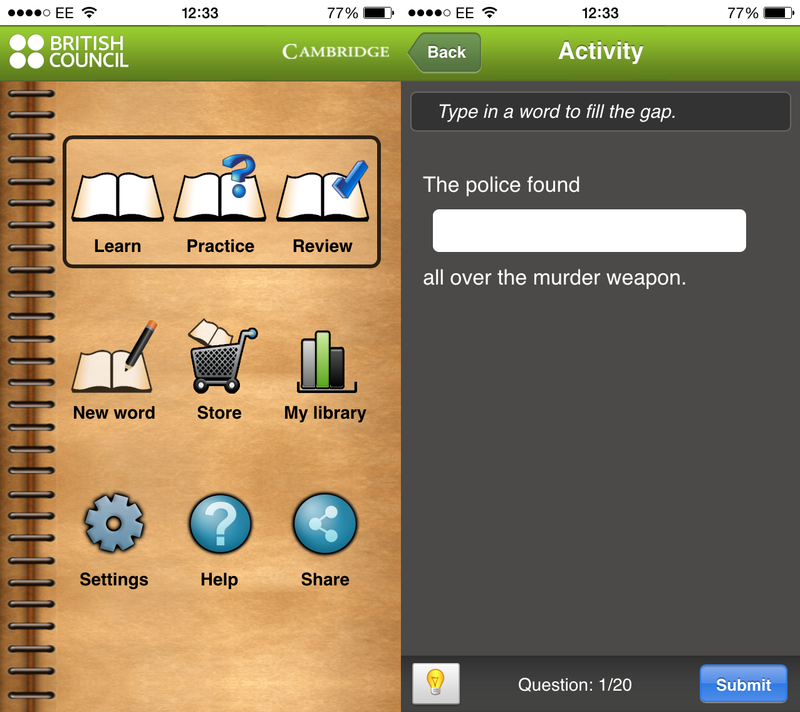 Learning English (or any language for that matter) can be challenging, however we have found six of the best apps which can help to make this learning process so much easier. In between your English language lessons with us, you can enhance your learning and gain a greater understanding of the language with these fun and engaging apps. 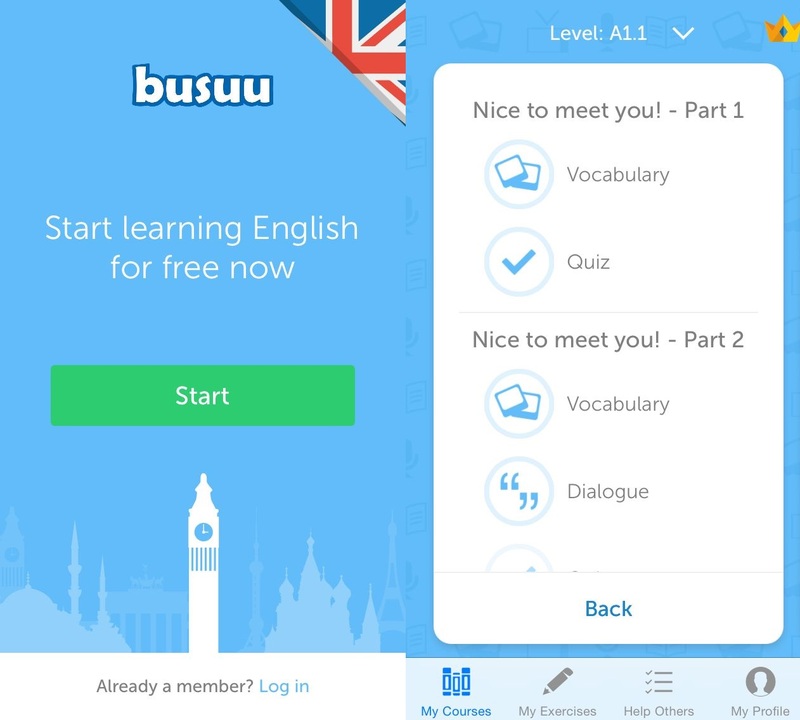 With these free iOS and Android apps you can put your smartphone to good use and improve your English language skills on the go, whenever or wherever you are. Rated as a “must-have app for 2014”, busuu is a fun and interactive way to learn English. There is a great range of English levels to choose from which means that your learning will be perfectly suited to you, and will allow you to start with the very basics if you are a beginner. With interactive tests, audio dialogues and grammar and vocabulary lessons, there is no chance of you getting bored easily, and there’s even a feature which allows you to submit practice exercises for native speakers of English to explain. The best thing about this app is that it doesn’t need an internet connection to work, so you won’t be cut off in the middle of an exercise and you will be able to access all of the learning materials whenever you need them. 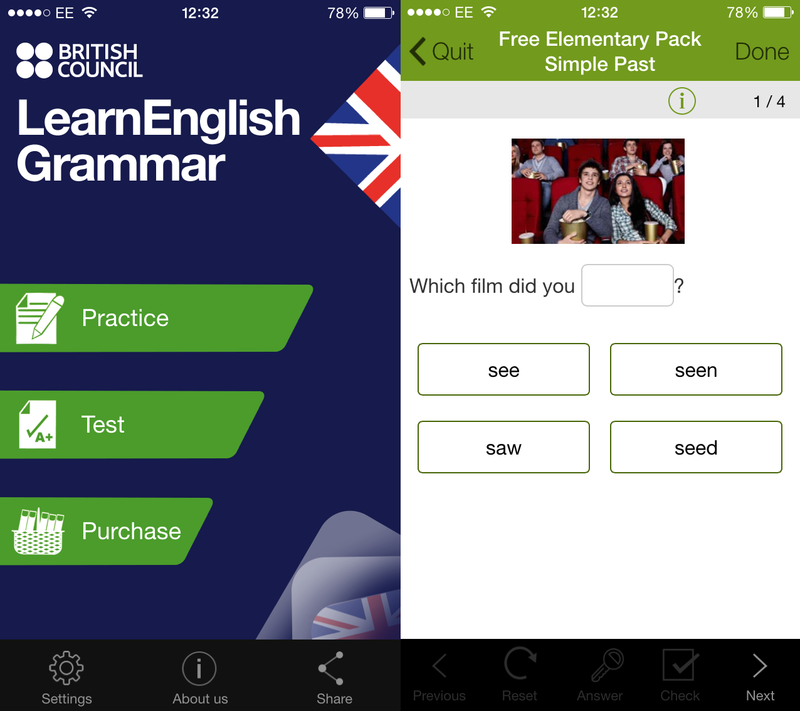 The British Council have helpfully created a whole range of free apps to assist you in learning English, and this one in particular focuses on grammar. 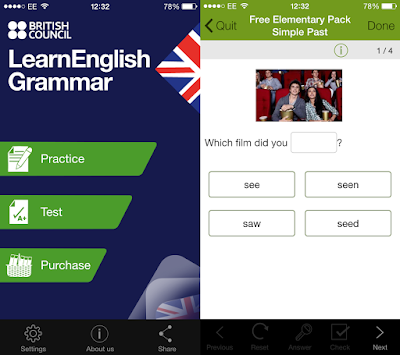 This app is great if you want to develop your grammar, as it gives you the chance to practice and then test your skills across a range of areas, including present perfect, past perfect and phrasal verbs. The app will give you a series of simple exercises like sentence re-ordering and multiple choice questions, which is a great way to help you remember grammar and learn new skills. There are study packs for learners of elementary, intermediate and advanced English levels so this app is great for learners of most abilities, however you will need at least a basic understanding of English to understand how to use it, (though if you can understand this, you’ll be fine). The other issue with this app is that you only get a few free lessons to study, so you’ll have to pay for the rest if you wish to continue developing your skills. 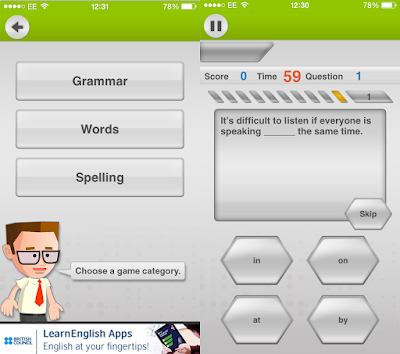 This 60-second quiz app by the British Council adds an element of excitement to practising English grammar. The aim of the game is to beat the clock and answer as many spelling, vocabulary and grammar questions as you can in 60 seconds related to 10 common questions, including food, travel and hobbies. As you go through the levels easy, medium and hard you will gain badges that you can share with others on a leader board, and will give your learning a competitive edge and boost your skills. The only down side to this app is that it is limited in the amount of questions it asks you, so after using this app for a while, you will begin to test your memory rather than your grammar skills. 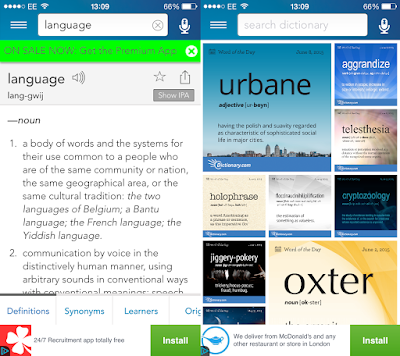 Containing 100 (2,000 if you pay) of the most frequently used words and phrases in the British language, Word Power app will help you to learn essential and relevant vocabulary so you can use English in everyday situations. You will learn vocabulary related to travel, going to restaurants, shopping and many more, and the app doubles up as a mini-travel guide that is packed with cultural insights and practical British English phrases. There are audio recordings of a native English speaker saying the words, so you will be able to perfect your pronunciation anywhere and at any time. Bring your learning to life with My Word Book app created by the British Council. 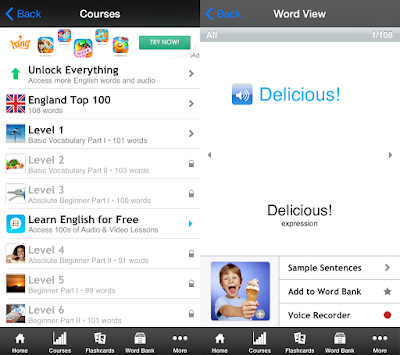 This incredibly resourceful app is an interactive vocabulary notebook, which will help you to learn essential words in the English language through sets of flashcards containing pictures, sounds, example sentences, translations and notes. The word data comes from Cambridge University Press’ learner dictionaries, which is assuring as you can trust the app to provide you with correct and relevant vocabulary to use in everyday situations. Once you’ve learnt a word the app will place it into the review section, so you won’t keep getting flashcards with the same words. If you’re feeling a bit more creative you can even create your own flashcards containing the vocabulary that you want to focus on learning. When learning a new language, you will find a dictionary to be an invaluable resource, as it will help you to learn new words and expand your vocabulary. Instead of hauling around a heavy dictionary, just download this handy app, where you can search and discover the meaning of any word in the English dictionary. The Dictionary.com app is very similar to the actual website – it will provide you with the meaning, an audio pronunciation, a sentence example and relevant synonyms of your word, which is a great way to help you enrich your vocabulary and expand your English language knowledge. Are you learning English? 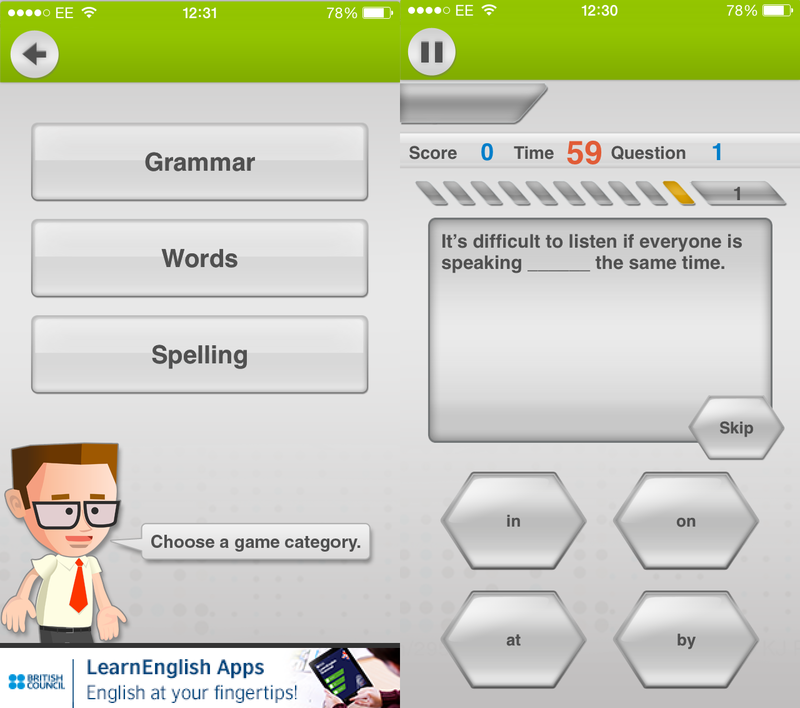 Can you think of any other great apps that can help you learn English? Let us know in the comments below or on Facebook and Twitter!